Residents of Scarborough will be offered help on saving energy and making their homes more energy efficient as part of the Big Energy Saving Week national campaign, a recent news report has been able to find. Big Energy Saving Week is a national campaign running from 26 October to 1 November, which is run by Citizens Advice Bureau (CAB) and supported by charities, the Government and the energy industry. The aim is to help consumers check they are on the best deal, switch tariff or supplier and take up help to insulate their homes and reduce their energy usage. In terms of implementing energy efficiency projects, wireless programmable thermostatic radiator valves offer the best ROIs and lowest overall installation costs. 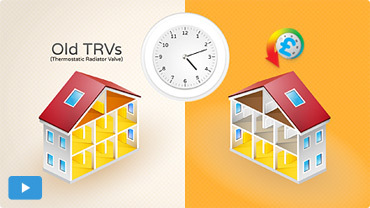 The HeatSave wireless TRVs enable users to set specific functioning times for each valve, and, since radiators are individually controlled, occupants are fully capable to maximise the zoning potential and reduce energy consumption in those areas that are not used for longer periods of time (as for example, dining or sitting rooms and kitchens during the night, etc. ).